For three weeks YAPP (PBS) is in trunk now and we had some games using the feature of Path (Based) Signals. I had a closer look at this feature and some serious discussions with developers and other players. In this review, I want to collect and summarize the main aspects of YAPP as far as I understood them, show you new possibilities for terminus-like stations, pitfalls and much more. 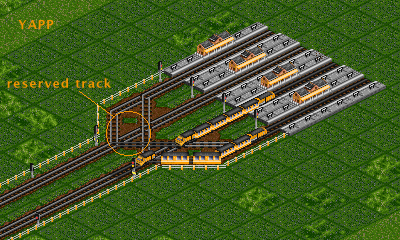 Yet Another PBS Patch or in short YAPP is a new engine of pathfinding, which enables trains to share track blocks. In this article we wrote about this new engine before and now we are testing it on our Public Server Game 101. Right after our jubilee game a new step in the development of Open TTD. YAPP requires new building techniques as in different signalling and different station entry/ exit layouts. Join us in playing and testing this feature on the public server now!